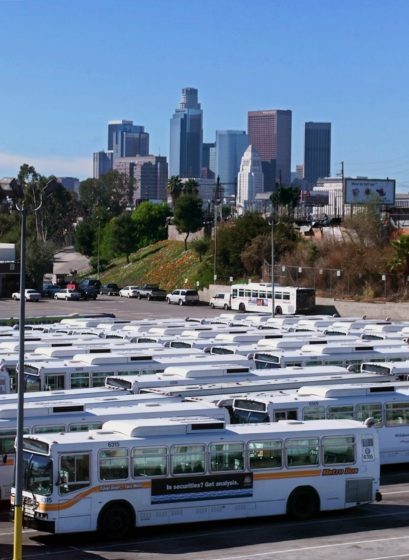 The Los Angeles skyline is in the background of a Metropolitan Transit Authority bus depot in 2000. A nonprofit organization will be repaid for legal fees it incurred to defend the public’s right to public records about a Los Angeles transit authority contract with a Canadian bus manufacturer. Jobs to Move America, which urges state and local governments to do business with companies that hire locally and pay livable wages, had requested data to determine whether the company, New Flyer, was living up to its hiring and wage commitments. In a ruling late last month, Los Angeles County Superior Court Judge Mary H. Strobel awarded $170,000 in legal fees to Jobs to Move America, to be paid by New Flyer, which had sued the Los Angeles County Metropolitan Transit Authority. The bus company was trying to block public release of data about the company’s compliance with hiring and wage commitments it made when it signed a $500 million deal in 2013 to sell buses to the transit agency. The transit agency did not oppose the company’s move to block the release of the records. So Jobs to Move America stepped in to try to enforce the law. The fee award came in what is known as a reverse Freedom of Information Act case. It followed Strobel’s October ruling that the transit agency was required to give the public detailed information about job creation and wages, despite objections from New Flyer, which claimed the data were proprietary and trade secrets. The judge then determined in March that Jobs to Move America was entitled to legal fees for, in essence, acting as a private attorney general defending the public’s right to the data. The case has spurred changes at the transit authority, which now automatically discloses job and wage data in contract compliance documents when a member of the public requests that information, according to David Sotero, an agency spokesman. The information no longer will be considered a “trade secret,” exempt from disclosure under California law. New Flyer’s 2013 contract bid to supply 900 compressed natural gas buses received a boost for promising to create new jobs in California and elsewhere in the United States. The company said it would pay these employees living wages and competitive benefits. In early 2016, Jobs to Move America asked the Los Angeles transit authority to provide data on whether New Flyer was keeping its promises. New Flyer sued to block that disclosure, claiming the data were exempt from disclosure because they were trade secrets and under California law, could be concealed. The transit authority had planned to release the information to respond to Jobs to Move America’s request but it didn’t fight New Flyer’s lawsuit. That left it to Jobs to Move America to spend more than 18 months in court challenging the company’s claims. All but one state – Massachusetts – has a trade secret exemption to public records laws, which is widely used by companies with public contracts to block disclosure of all types of data and corporate details. The practice was highlighted in Reveal from The Center for Investigative Reporting’s State Secrets, a five-part series on state and local government secrecy. Government agencies often rely on the contractor to decide what is or is not a trade secret and whether disclosure would harm the company. While Strobel did not invalidate California’s trade secret exemption, she found that New Flyer has provided the transit agency some documents with wage details and had not marked them confidential. That led the judge to conclude that the company had not done enough to keep the job and wage information secret, effectively waiving the trade secret exemption to disclosure. Strobel also ruled that the public’s interest in learning whether the company had fulfilled the terms of the deal overrode the company’s privacy concerns. Requests for comment from New Flyer and its lawyer John Danos went unanswered. The company has about a month remaining to decide whether it will appeal the legal fees award. Miranda S. Spivack can be reached at mirandaspivack@yahoo.com. Follow her on Twitter: @mirandareporter.